For something that began as a hangout spot among friends, by a guy who didn’t even really cycle, Factory Five worked out pretty well. Sometimes the best businesses start by accident and grow from there. That’s how the story begins for Factory Five, Shanghai’s foremost boutique bike shop, and the Chinese city’s first place to buy fixed gear bicycles. It’s owned by three expats: Jeff Liu from New Orleans, USA, Drew Bates from the UK, and Tyler Bowa, a Canadian, originally from Waterloo, Ontario. The latter is bearded and tall, a friendly dose of Canada far from home. When Tyler moved to Shanghai in late 2008, he was looking to get involved in the music scene. In its absence, cycling took over. But he and his friends quickly discovered something was missing. So they created that spot. With the money leftover from an Alleycat race they organized, the friends opened their first location in 2010: a 20 square metre lane house in Shanghai’s French Concession. Weekend hours trickled by, sitting at the picnic table, drinking beer, and fixing friends’ bikes. China has a long history with bicycles, and the two-wheeled “foreign horses” were the transportation of choice for much of the 20th century. Bikes appeared on government propaganda and in advertisements, and production scaled dramatically in 1949 during the Chinese Communist Revolution. 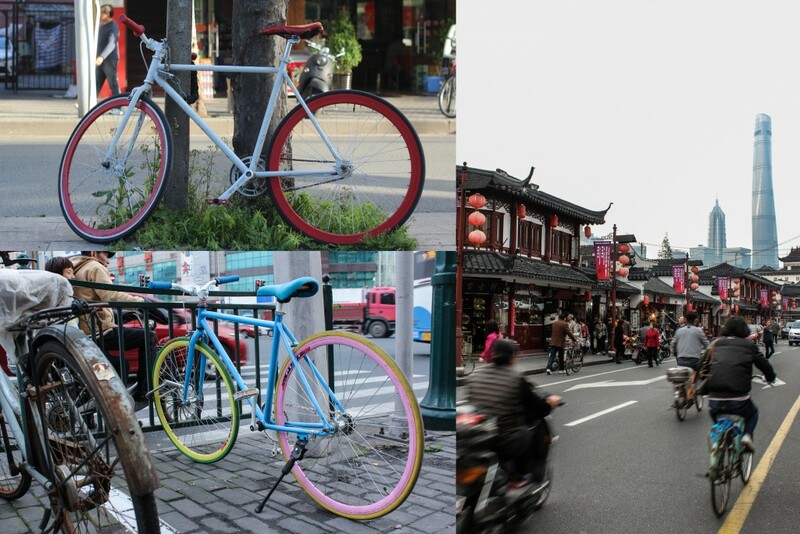 Millions of bikes were manufactured in Chinese factories during the decades. So influential were bicycles that when foreign leaders visited China, they were presented with one of their own. Soon they were stripping those bikes of their old mechanics – a transformation of new components on a classic frame. The old-meets-new refurbishments were a hit, and orders poured in. Those Chinese classics are more coveted now. Five years in, Factory Five has rebuilt, by hand, almost 1,000 classic bikes, nearly depleting the warehouse supply of the frames. 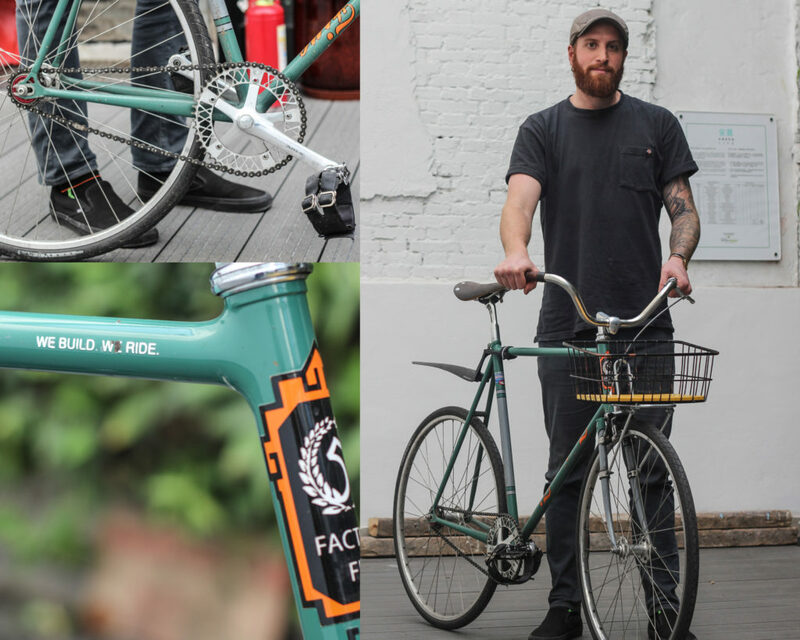 Knowing they’d hit that limit, Factory Five now creates its own products, including a line of custom F5 fixed fear and single speed framesets. They’ve also got specialty components and apparel (check out their Chairman Mao racer jersey), and source other accessories from brands around the world. 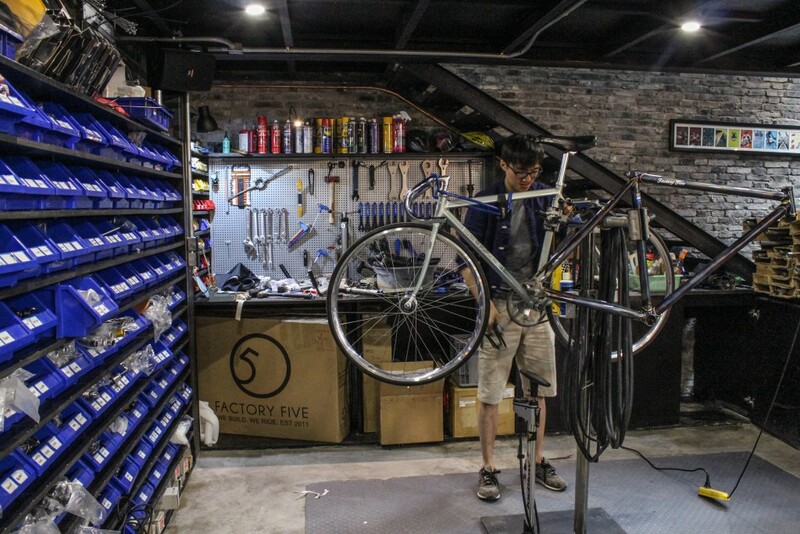 Fixie bikes became so popular in Shanghai that Factory Five has had to move and expand locations three times in the past five years. 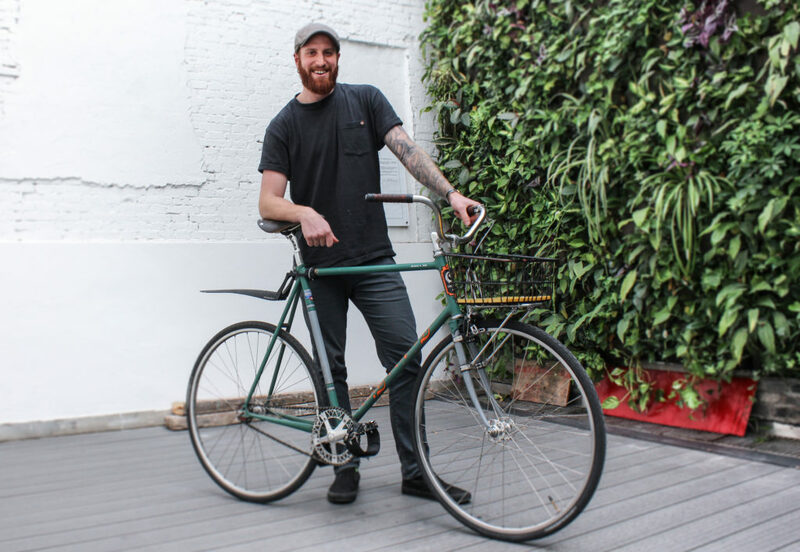 Tyler and the custom fixed gear bike he uses daily. Just as Factory Five was never exclusively about selling bikes when it opened, that outlook prevails today. 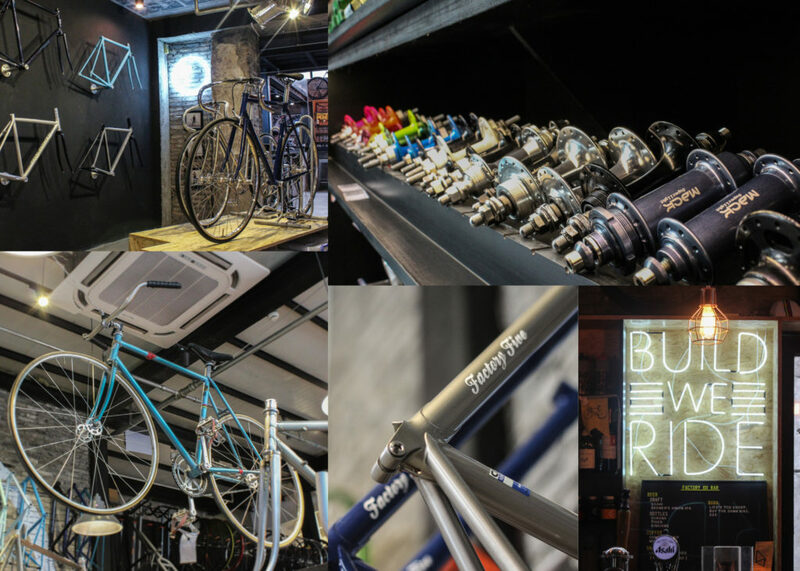 It’s a bike boutique with a strong cycling community riding on its handlebars. 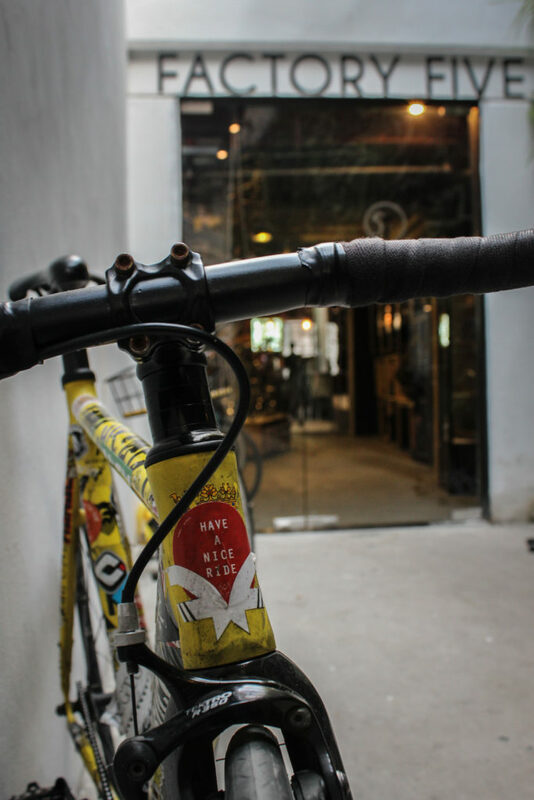 That cycling community can include one of the many parties Factory Fives throws at its location – a shiny new space in a converted wet market in Shanghai’s Jing’an District. It’s a cool spot where you’re just as likely to sit and sip a beer or espresso from the bar as you are to buy a bike. 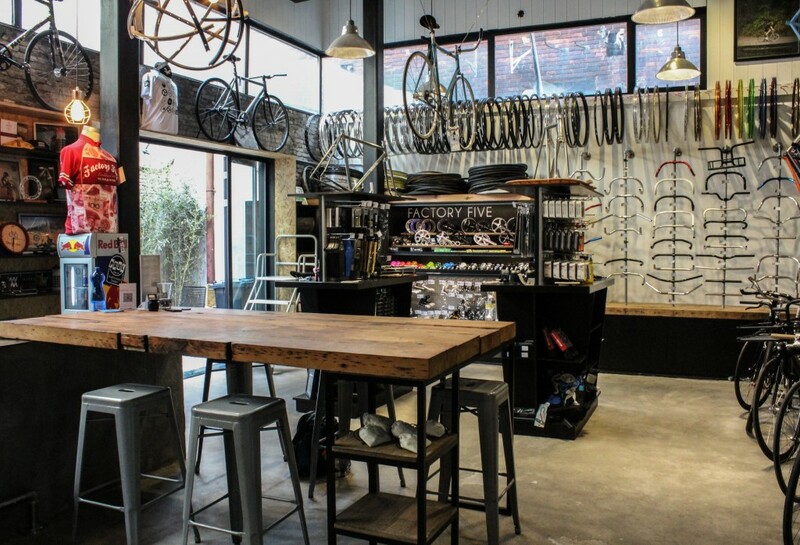 Shop interior, home to bikes-of-your-dreams, massive parties. 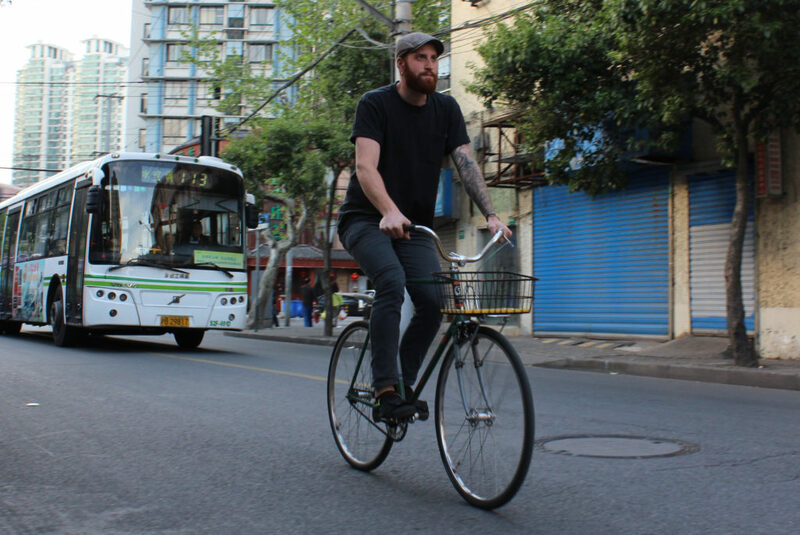 There’s also the incredibly popular weekly social rides that are currently on-hold as Factory Five finds a way to work with the government to accommodate the 500+ cyclists taking over the streets of downtown Shanghai. It’s the world’s largest regular night ride. 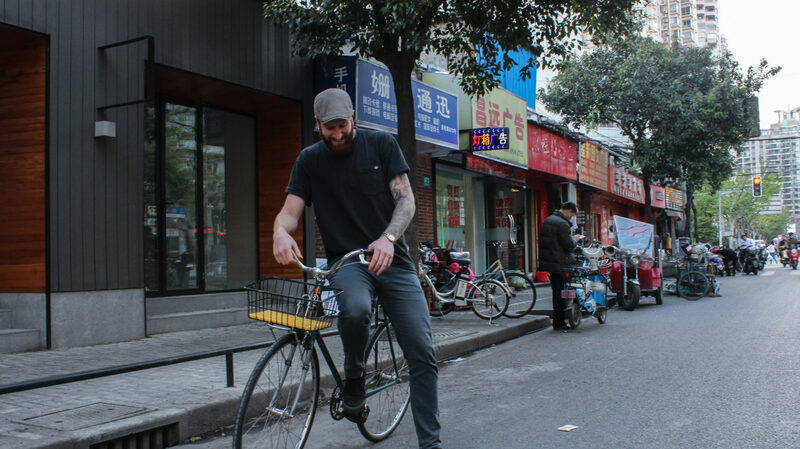 That sense of community and critical mass can be key in convincing first-time Shanghai cyclists to get on their saddles. Despite being flat-as-a-pancake, cycling in Shanghai is no leisurely ride on a backcountry road. There’s always going to be someone walking out in front of you and there are always going to be cars. 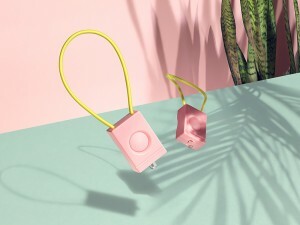 Factory Five’s products are resonating internationally. When they first opened, 100 per cent of their customers were expats living in Shanghai – now 70 per cent of their business is local Shanghainese. Factory Five ships internationally more than they do within mainland China, with the United States, United Kingdom, and Australia serving as the three main hubs. 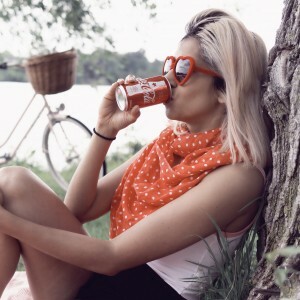 As for Canada, it just so happens that Factory Five will soon start selling in its first Ottawa location (a store is still TBD). Sitting amidst the hanging frames in the bike shop he helped build, it’s fortuitous that things never quite went as planned when Tyler first came to Shanghai. With the combination of classic frames, first-class components and accessories, and a new set of geared frames rolling onto the market, Factory Five plans to continue growing its brand inside and outside China. Factory Five frames, components, for sale in shop. Journalist, photographer, maker of things.